In a moment of hubris two months ago I decided it might be cool to spend 11 straight hours on a bike pedaling 295 kilometers from Milan to San Remo on the Italian Riviera near France. And so it was that I shelled out the entry fee (plus the fee to get a bus ride back for my bike and me) to take part in the annual Milano-San Remo bike race for amateurs. 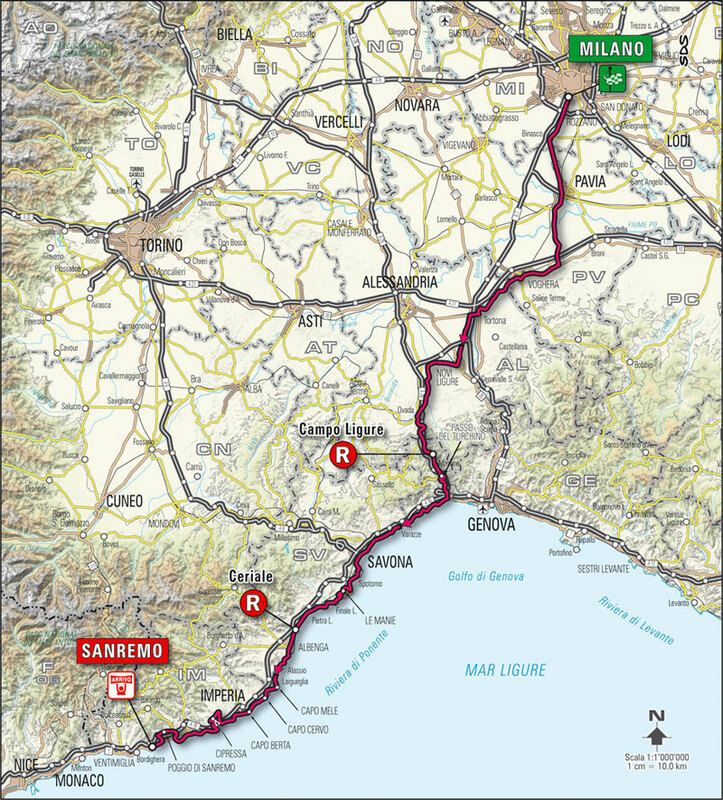 The real Milano-San Remo race (with Fabian Cancellara, Mark Cavandish and the like gunning for success) every March shoots from Milan south to the Ligurian coast just west of Genoa and then proceeds towards the French border stopping in San Remo. We mortals will be following the exact same route of what is the longest of the professional one-day races know as the classics. The amateur ride is this Sunday, June 9. If you are wondering what the odds are on me, here you go: that I win the race (there are 700 entrants) about 1 to 17 million, and about even odds that I manage to drag myself and my bike to the finish line. Fortunately a bus sweeps the back of the race to pick up those who crash and those who just can’t go on. I was already pushing it by trying to prepare in only two months – when I had hardly done any serious biking for the two years previous – but things got even more challenging with the near-constant rain here in northern Italy for months making it difficult to plan time for long rides. For those who wonder how you prepare a particularly long bike race, I think you just pretend you are getting ready for a marathon (2-3 short or medium runs per week coupled with another run that gets progressively longer every week until you arrive at 80% of the race distance) and multiple all the distances you would run by 7. So a 25-kilometer training run becomes a 175-kilometer training ride. Anyway, that’s what I did though if anybody has a better approach please let me know and maybe I’ll try it for next time. I’ve come to see completing the Milano-San Remo (or at least taking part) as an important event marking my time spent in Milan. 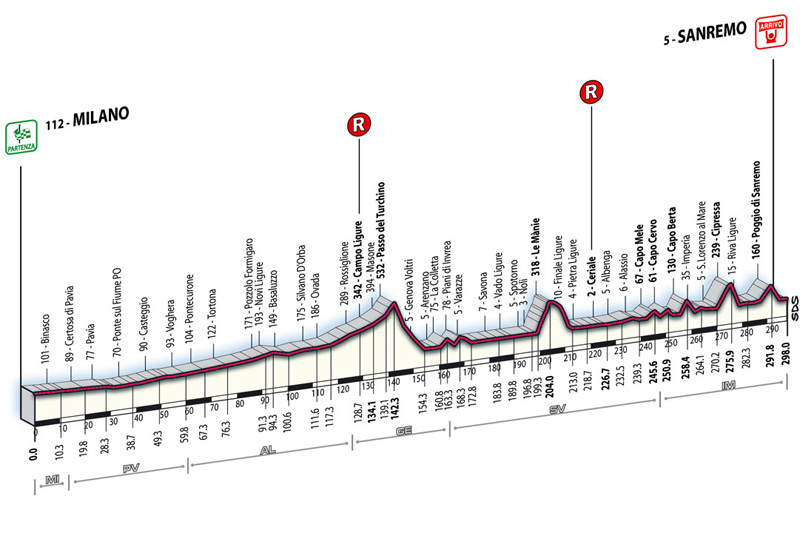 I’ve been here for a long time, ages really, but things change and perhaps one day soon I’ll be living in another city and I’ll regret not having attempted the Milano-San Remo when Milan was my home. Doing a marathon is great, but doing it in your home town is special. At least that is the reasoning here. 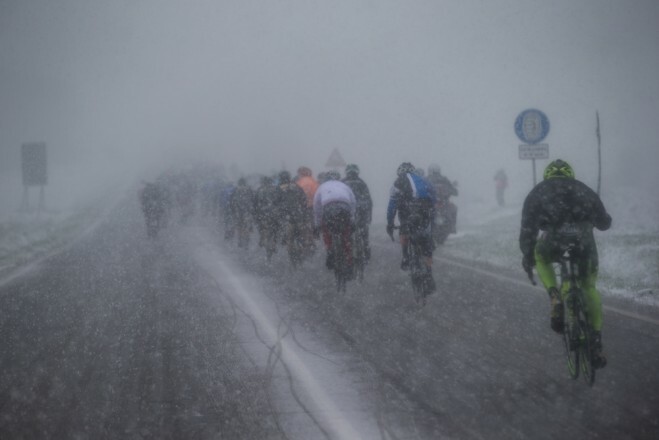 That aforementioned hubris that got me started on this race was in no small part due to my having watched in admiration as the professionals took part in a particularly heroic Milano-San Remo this past March that included a snow storm. Fortunately the forecast for this Sunday says nothing worse than some rain. Rivers of text have been written about the yearly professional race; here is a particularly informative article that gives a taste of what ride is like. As far as amateurs go, I have found two interesting accounts, both by Brits, quite useful for my preparations. The professionals finish the race in about seven hours, the best amateurs in about 8 hours and, as mentioned, yours truly is hoping to finish in 11 hours. Stay tuned.